Length between the arms is 177", Height of the arms is 50", width of the legs is 48". Large heavy duty powder coated Steel frame supports up to 450 lbs and suitable for two adults. Includes Steel chain and carabiners to attach your hammock. Easy to disassemble with ergonomic screws when not being used. Perfect for one or cozy for two, the Classic Accessories steel hammock stand provides the ideal place for relaxation. Rest assured knowing that your hammock will retain its look season after season. A practical, artful design with clean lines softened by a cool Grey powder coating give this stand a look of simple integrity that will stand the test of time. You are not just purchasing a hammock stand; you’re also purchasing peace of mind. 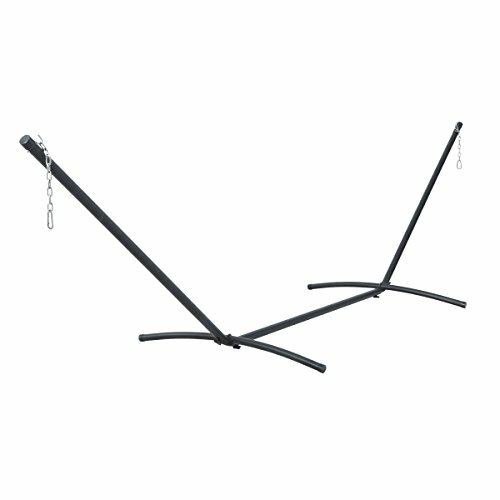 Rest in comfort when you buy a Classic Accessories steel hammock stand. No matter the location, you’ll be protected with the easiest warranty in the industry. If your steel hammock stand fails within the warranty period, look for us online & take advantage of our hassle-free warranty program supported by our us-based customer service team.